In this article we will see how to show dates of other months in current month display. In default display, jQuery DatePicker shows only dates of current month. Not only you could see the dates of other month but also you can select the dates. In order to show dates of other month, we need to set boolean property showOtherMonth to true. We need to set boolean property selectOtherMonth to true to select other dates. 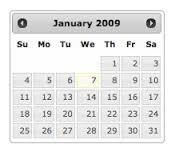 Thus by this way we can show dates of other months and even can select them.